Cempatch Rapid Repair Mortar is a pre-packed single component cementitious repair mortar suitable for repairing and making good internal floors, stairs and steps and for general repairs to cracks and holes. Cempatch Rapid Repair Mortar can be applied to rigid sound surfaces – sand/cement screed or concrete bases, asphalt, granolithic, terrazzo, ceramic and quarry tiles, epoxy and polyurethane coatings. Store under cover, in unopened bags clear of the ground in cool dry conditions,protected from frost and excessive draught. 9 months in an unopened sack. A 22 kg sack mixed with 5 litres of water will produce approximately 13.5 litres of mortar. A litre of mortar will cover 1m² at a thickness of 1mm. It is not usually necessary to prime absorbent surfaces. However, to ensure satisfactory bonding, the prepared surface should be dampened down to minimise suction. Ensure that the surface is in a saturated surface dry condition prior to application of Cempatch Rapid Repair Mortar, i.e. no visible surface water. Absorbent surfaces should be dampened with clean water. Very absorbent surfaces must be primed with dilute Neoprene Primer. Non absorbent surfaces must be primed with neat Neoprene Primer. The primer should be used in accordance with the instructions printed on the Product Data Sheet and must be allowed to dry before applying the repair mortar. Cempatch Rapid Repair Mortar should be mixed in the proportions of 22 kg of powder to 4.6 – 5.5 litres of water or between 3:1 to 4:1 by volume. Add Cempatch Rapid Repair Mortar powder to the required amount of water in a clean container and mix until a homogenous, smooth, slump-free consistency is obtained. Only mix enough mortar that can be applied before the product begins to set (approx. 10 – 15 minutes). 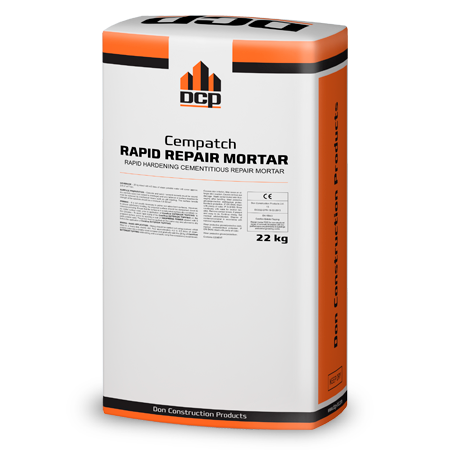 Cempatch Rapid Repair Mortar can be applied up to a thickness of 20mm. For increased economy the mortar can be bulked out by adding up to an equal volume of graded aggregate. Small localised repairs over 20mm, but not exceeding 50mm, should be bulked out with an equal weight of graded aggregate. Mixing is best achieved using a drill fitted with a power whisk. The working time will be extended at low temperatures and reduced at higher temperatures. For best results over large areas apply the mortar with a steel trowel at a thickness of 2 – 3 mm. To produce a smooth repair surface ready to receive floor coverings, finish with a wet smoothing trowel before the mortar has fully set, i.e. 15 - 20 minutes. To ensure a level surface when filling holes and cracks, trowel the mortar in to the area and apply pressure to ensure the mortar covers the repair surface. Fill the repair leaving the mortar proud of the surrounding area, then float or grind to the required level after approx. 20 minutes. Overcoating can commence after approximately 1½ hours at 20°C @ 2mm. Tools should be washed with water immediately after use. Do not place when the substrate temperature is below 5°C or when the ambient temperature is 10°C and falling. Do not exceed the maximum recommended water content and only use clean potable water. This product is not recommended for external use. Consult the appropriate Material Safety Data Sheet before using Cempatch Rapid Repair Mortar. GENERAL GUIDANCE This data sheet is for general guidance purposes only and may contain information that is inappropriate for certain conditions of use. Accordingly, all recommendations and suggestions are made without guarantee. Further information is available from our Technical Department.